Home to the Secret Service - MI5. I had been passed Thames House on various occasions, but because of the sheer size of the building, it was difficult to get a nice photo of it. Thankfully, a trip on a London Duck Tour gave me the perfect opportunity to get this shot. Constructed between 1929-30, Thames House was originally the headquarters for International Nickel Ltd.. along with other companies. In 1994, following a rather extensive upgrade, MI5 and the Northern Ireland Office moved into the building. 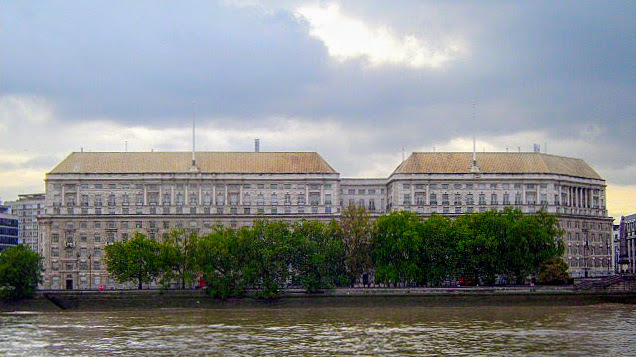 The Northern Ireland Office would later move to Horse Guards Road, along side HM Treasury and the Cabinet Office, leaving MI5 as the sole inhabitants. In 2007 the building came under the protection of Section 128 of the Serious Organised Crime and Police Act 2005, making it a criminal offence for a person to trespass into the building, with exception to the steps that give access to the building. Thames House is Grade II listed.